Up until 8 months ago, hubby was dead set against broccoli. He wanted nothing to do with the vegetable. I for one couldn’t comprehend this. I am and always have been a huge fan of the green tree like vegetable. It was almost heartbreaking to know that he couldn’t stand it and so I persisted in my attempt to convert him. 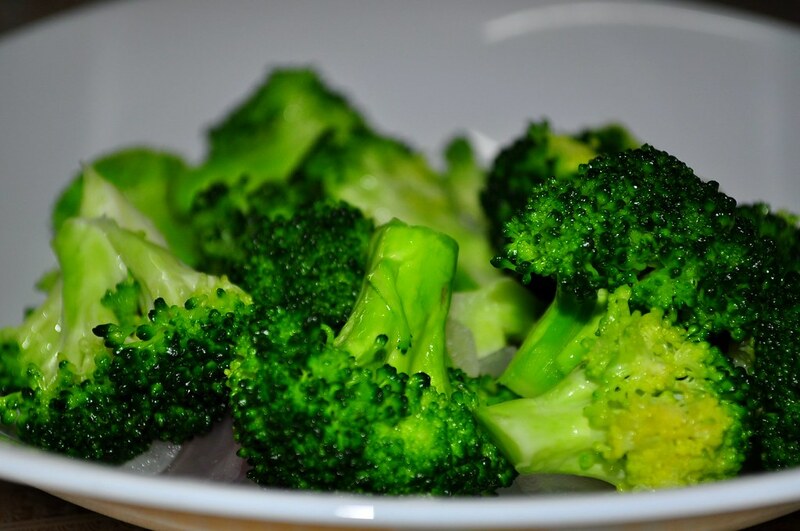 I would buy broccoli and steam it just enough to achieve that beautiful vibrant green colour you see in the picture, which allows it to maintain it’s crunch and minimizes the loss of nutrients. After all, broccoli is rich in vitamins and minerals and is an excellent source of Vitamin C, dietary fibre and is a natural anti-carcinogenic. So, I would place a bowl of beautifully steamed broccoli florets at the dinner table, hoping to entice hubby, but he would never touch it and I would end up eating the whole bowl myself, not that I’m complaining. Then one day about 8 months ago, as we sat at the dinner table and I started devouring the bowl of broccoli in front of me, hubby looked at me, and to my amazement asked “can I try one?”. I was astonished to say the least, but after the initial shock wore off, I let him have one ;-). I had sprinkled it with Umeboshi Plum Vinegar to give a nice tart, salty taste. Let’s just say it was love at first bite and I found myself having to share the rest of it. Since then, hubby has become broccoli’s #1 fan, and I’m not exaggerating one bit. He went from refusing to try it, to craving it several times a week. It has become a sort of addiction and a regular item on our menu, from Simple Steamed Broccoli, to Broccoli and Almond Soup, to Vegan Sformatini di Broccoli (a sformatino is a traditional Italian dish which is a cross between a flan and a soufflé, and usually contains eggs and/or beschamella sauce and any vegetable or combination of vegetables, but I’ll save the details and recipe for another post so check back soon). Simply put, broccoli has become a part of our family. We love it and we couldn’t imagine our menu without it. While hubby now enjoys anything with the word broccoli in it, his favourite is still Simple Steamed Broccoli which we both agree must be steamed to perfection, stay crunchy but not hard, and be a vibrant bright green colour. Steamer Basket – avoid submerging the broccoli in water. Bring a pot of water to boil, then place a steamer basket full of broccoli on top, and cover with a lid. Cooking Time – the broccoli will be ready in about 3 minutes. Longer cooking time is what usually results in mushy and colourless broccoli. It’s important to remove it from the steamer basket as soon as possible, or it will continue to cook long after you’ve turned off the heat. Serving Dish – Yes! This is important, especially if you make a large amount of broccoli. If you place the hot steamy florets in a deep blow, they will continue to cook. It’s important to place them in a shallow bowl or serving dish so they have room to breathe. Note: If you don’t have a steamer basket, you can bring the water to a boil, then drop the broccoli inside, turn off the heat and cover with a lid for 2-3 minutes, then strain the broccoli immediately. After 3 minutes, they start to lose nutrients and get mushy. This may very well be common sense to many of you, but I’ve had my fair share of terrible overcooked broccoli in many restaurants, and in fact hubby says that’s why he hated broccoli for so many years, he had never had it bright green and crunchy and it was always overcooked and mushy, which has a great deal of impact on the taste, not to mention the nutrient value. All this talk about broccoli has got me thinking about tonight’s dinner. I picked up a few heads of organic broccoli from the supermarket this afternoon on my way home, so I’m thinking about Broccoli & Almond Soup or Quinoa & Broccoli Pilaf…find out tomorrow, when I post the recipe.